CARACAS, Mar 28 2018 (IPS) - On-line media have taken the lead, ahead of the conventional media, in reporting in the tense political and economic climate in Venezuela, where freedom of speech and of information are under siege. 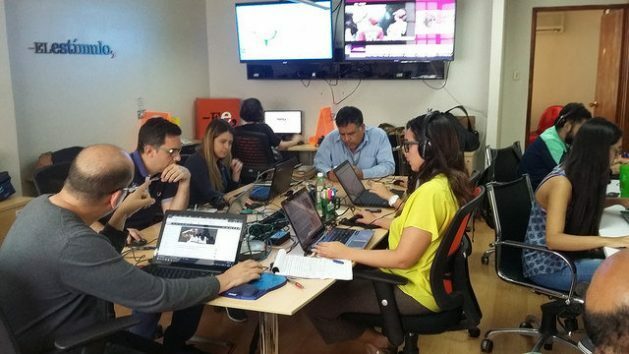 In Venezuela, “the closure of traditional media, the purchase of others and the coercion exercised over companies and journalists have given a boost to digital media, beyond the fact that they are linked to the progress and popularisation of technologies,” journalist Omar Lugo, director of the digital media platform El Estímulo, told IPS. The study Internet Use in Latin America, by the specialised firm Digital Trends, states that “on-line media have become the alternative to staying informed in Venezuela,” with 81 percent of internet users turning to the web to get news, above the Latin American average of 72 percent. In this country of 31.8 million inhabitants, according to the governmental National Institute of Statistics, 62 percent have access to the internet, “although the internet speed is among the lowest in Latin America, affecting access to information,” said Mariaengracia Chirinos, of the Press and Society Institute (IPYS). A study by IPYS Venezuela found that in January and February 2018 the fixed broadband speed in Venezuela was just 1.6 microbits per second (Mbps), against a regional average of 5.6 Mbps. “The precarious technology in the country, the slow internet speed and meddling in the web are serious problems for on-line media that are trying to gain more space,” journalist Yelitza Linares, of the El Pitazo news portal, told IPS. The heads of portals perceived as critical of the government of Nicolás Maduro say their connection is often blocked, their webpages are hacked, or are flooded by bot accounts, until they collapse. “Official sources are closed to independent journalism. On our portal El Interés, dedicated to the economy, we cannot get an interview with a minister or a senior government official. There is no access to decision-making spheres, state-run companies, or financial or health statistics,” said Lugo. And the other issue is that “the collapse of the economy affects the entire industry, all the media, advertising disappears, exchange controls prevent imports of equipment and supplies, and hyperinflation drives up costs and destroys the ability to properly remunerate employees and collaborators,” he added. Venezuela’s GDP has plunged 37 percent in the last four years, and the inflation rate stood at 2,700 percent in 2017, according to consultancy firms and the finance commission in the opposition-controlled parliament. Official figures are not available. The digital media, and more specifically the fifty or so news portals and aggregators, grew in the last decade in Venezuela, as newspapers, radio and television outlets were closing, shrinking or changing ownership. In 2007 Radio Caracas TV – the oldest and for decades the most popular television station in the country – lost its concession by order of then President Hugo Chávez (1999-2013). From then on, the monitoring of radio and television stations resulted in fines, closings, cancellation of licenses and dismissals of media workers. Many print media were trapped by the severe exchange controls in force since 2003, which prevented them from accessing currency to import paper and other inputs. Leading daily newspapers turned into weeklies, with fewer pages and smaller print runs, and many ended up closing or are trying to survive on the internet. In 2013, after Maduro took office, two powerful national newspapers and the only television station dedicated solely to news, Globovisión, changed hands in financial operations that were kept under wraps, which resulted in a change in their editorial line, to government-aligned positions. IPYS Venezuela, a non-governmental organisation dedicated since 2002 to the promotion and defence of free speech, has documented the closure of 100 media outlets since 2005, 60 of them under the Maduro administration. Also under Maduro, 57 audiovisual media outlets have been suspended, including the order for pay TV operators to take off the air international channels such as CNN in Spanish, TN from Argentina and NTN24, RCN and Caracol from Colombia. To this scenario are added the difficulties faced by journalists in doing field work, especially when they have to cover incidents arising from the extreme political polarisation, such as the four months of protests and unrest in the streets that led to more than 100 casualties in 2017. Espacio Público, a non-governmental organisation that assesses free speech and freedom of information, last year recorded 1,001 attacks on freedom of expression, including assaults, threats, arrests of journalists, damage to their equipment, acts of censorship and closures or other measures to crack down on the media. “On any given day an emerging media outlet is cited as an enemy of the State, groups associated with the government engage in intimidation, there are restrictions arising from the economic situation, to get access to sources, or to newsprint. We swim against the current,” Luz Mely Reyes, director of the independent on-line outlet Efecto Cocuyo, told IPS. In that haphazard journey, several digital news media have chosen to forge alliances, in first place for exchanges with the aim of protecting themselves and their media workers in the hostile environment in which they operate. But they have also joined forces “to carry out coverages, training workshops, panel discussion, and for access to and distribution of content. At Efecto Cocuyo, we have worked with Animal Político from Mexico, Ojo Público from Perú and the website El Tiempo from Colombia,” said Reyes, who has a proven track record in investigative journalism and political analysis. El Pitazo, RunRun.es and TalCual, a print newspaper which reinvented itself as a digital outlet, have expanded their alliance in the search for shared advertising in their effort to sustain their portals. “And we are looking for cooperation mechanisms for safety at work, in the face of aggressions that are not only physical but judicial. In Venezuela, a law against hate has been approved by which the press can easily be criminalised, in the midst of very tough political battles,” said Lugo. Digital media outlets have grown along with the conflicts. A new test is approaching, since on May 20 Venezuela will hold presidential elections, repudiated by a large part of the opposition and numerous governments in the Americas and Europe.